Eric began training in Shotokan Karate-do in 1993 at the YMCA. The coaching staff has consisted of Sensei Robert Lashin, Sensei Danny Leung, Sensei Eve McGrath, and Sensei Brian James. In 1998, Eric's hard work paid off when he received his Shodan (1st Degree Black Belt) in Shotokan Karate-do from Master Yutaka Yaguchi. Eric started to become interested in other forms of Martial Arts, so he began training under Sensei William Chung in Kobudo in 1998 and received his Shodan (1st Degree Black Belt) from Soke Seiko Suzuki, a student of Shinken Taira Kobudo (the father of Ryukyu Kobudo). Eric continued to train and received his Nidan (2nd Degree Black Belt) in Shotokan Karate-do from Master Teruyuki Okazaki in 2002. 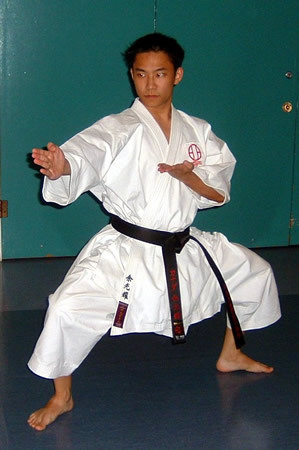 In 2004, Eric began training in Shito Ryu Karate-do under Sensei William Chung. In 2011, Eric earned his Yondan (4th Degree Black Belt) from the International Shihan Kai, which consists of the Japanese Executive council, the American Shihan Kai, & the Canadian Shihan Kai in Vancouver, BC. Currently, Eric is training and teaching with Sensei Danny Leung in Shotokan Karate, as well with Sensei William Chung in Seito Shito Ryu Karate-do plus, Shimbukan Kobudo.